Here is a sweet little doll by Eugene, from the mid-80's. The Ideal Toy Corporation made hair play dolls for years as you no doubt already know. Their 1983 12" Fashion Tressy was sold in brunette, blonde or as a redhead, in three different color outfits, all the same style. Included inside the box were perm rods and the ingredients to make a sugar water "perm solution." She also had a vinyl styling cape to protect her clothes. From the mid-80's, Playskool created the Dolly Surprise line. They came in many styles and sizes. Here are the Little Miss Dolly Suprise dolls, in a more diminuitive size. Here are the medium sized dolls in the group, at 10 inches. Some of these dolls were sensitive to light and got "sunburns" on their little noses. Their left arm acted as a "crank" to make their hair switch reel into the head. Raise it back up and it grew! Very cool! What hair-play collection would be complete without sets to use to fix Dolly's hair? This super special set was a gift from my friend BillyBoy*. The front of this case has a picture on it that looks suspiciously like Holly Hobbie! Inside this cute case from the 80's is all sorts of items to style Dolly's hair. This precious little set has everything that an aspiring stylist might need to beautify his or her dolly! Here is a little brush and comb set that one could pick up from the dime store, circa mid-60's. 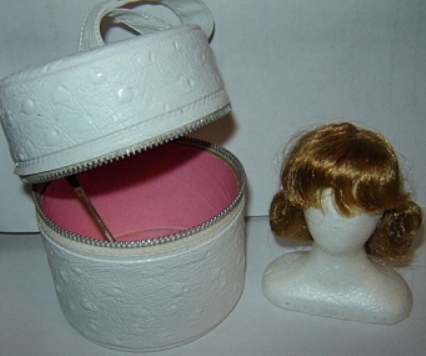 And finally, this little 4" high wig case holds a small wig and styrofoam wigstand. The wigstand stands about 3" high. This may be a little small for Crissy but it does well-illustrate how many diverse products there were out there to entertain budding hairstylists!